3 bedroom duplex apartment. 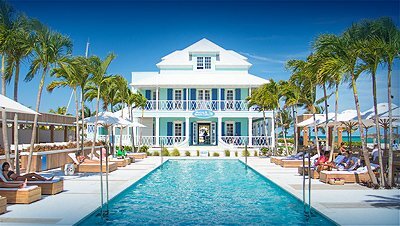 This beautiful new apartment fronts directly on to the marina within the grounds of a 69-acre resort and residential community which features 1,200 linear feet of powder-soft white sand beaches and a full-service, deep-water, 194-slip marina. Spacious apartment enjoys sublime, panoramic views which take in both the marina and the oceanfront. Designed in a luxurious, contemporary style, the interiors fuse effortless sophistication and raw natural beauty. 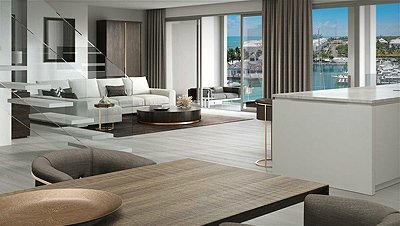 The luxury penthouses and condominiums feature stunning interior living areas which effortlessly transition to exterior spaces. 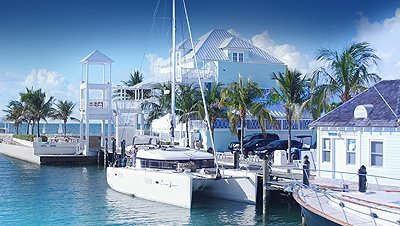 © Copyright 2019 | One Marina | Nassau | The Bahamas. Note: Any illustrations are conceptual and preliminary. Prices do not include upgrades or options, and promotions, incentives, features, options, amenities, floor plans, elevations, designs, materials and dimensions may vary in actual construction and are subject to change without notice. Area improvements and recreational features and amenities described are based upon current development plans and subject to change.